The outsole provided a stable grip, a satisfied runner said. The Merrell Vapor Glove 3 was a lightweight and flexible shoe that enabled a relaxed run, according to a wearer. Many users enjoyed the shoe’s minimal weight. Some consumers thought the Vapor Glove 3 was an affordable shoe. One runner was amazed at how the shoe improved their running gait. A couple of purchasers mentioned that the third version of the Vapor Glove brought better arch support compared to its previous generations. Several users reported the shoe’s upper and outsole separating after just a few uses. The midfoot area has an inaccurate fit, a runner stated. The upper mesh started to deteriorate within a few months of usage, according to few disappointed wearers. Some runners found the shoe to be too stiff. One buyer felt the toe box was small, and that it gave the foot cramps. The outsole of the Vapor Glove quickly wore out, a consumer said. The Merrell Vapor Glove 3, an affordable running shoe option, found itself in a unique situation, where the positive and negative feedback had come from the same people. The shoe was praised for being a comfortable minimalist shoe that had practical features and superb performance, yet it was also criticized – by the same users – for its durability. Overall, the Vapor Glove 3 was a good shoe, but many runners think it is not a worthy purchase because of its short lifespan. The Merrell Vapor Glove 3 is my favorite barefoot shoe on the market. It is so light and nimble that it actually feels like you are barefoot running, while at the same time being protected from hazards, such as sharp objects, slippery roads, and even cold weather. If you are looking to experience barefoot running in the most comfortable way possible, the Merrell vapor glove is the shoe for you. The Vapor Glove has a synthetic mesh upper. The upper is very soft and flexible. The mesh is tightly woven to give the shoe a little bit more protection against rain, snow, mud and trail debris, but it is still very breathable. Around the perimeter of the shoe is an impermeable plastic overlay. This gives the shoe extra resistance against the elements. When the shoe is completely flexed, the upper material rubs against the top of my foot at the flexion point of the shoe. This only caused a little bit of irritation on the top of my foot during long runs that I perform without socks. Minimalist shoes generally don't have heel cups. The vapor glove is no exception. It uses a plastic overlay to act as the heel cup. The heel collar is minimally padded but still very comfortable. Since the shoe does not have a heel cup, it is easy to put on the shoe without tying the laces. The Vapor Glove has an elastic tongue that feels very nice on the foot. The laces are also a little bit stretchy. The laces do not have to be tied very tightly to give the shoe a good fit, so the laces never caused pressure points on the top of my foot. The Vapor Glove has a fixed three-millimeter footbed. The fixed insole makes the shoe better for sockless running. The three-millimeter footbed is the extent of the midsole. It does almost nothing to dampen the impact of running, which is good because this is a barefoot shoe. The Vapor Glove has a straight fit. The shoe has a platform that matches the width of my foot. This fit is neither tight and obstructive, nor wide and clumsy. It makes me feel like I am truly barefoot running. My favorite part of any trail running shoe is the toe bumper. The Vapor Glove has a toe bumper that is made from a large piece of the outsole rubber that wraps around the toe. The toe bumper is very sturdy. While barefoot running, I watch the trail very closely so that I don’t step on or kick any big rocks, but the few times that I have used the toe bumper, it protected my feet well. The Vibram outsole is truly a work of art. It excels in flexibility, durability, and traction, the most important categories for any outsole. The Vapor Glove is the most flexible outsole that I have ever run in. With minimal force, it flexes in all directions. It is much more flexible than your foot, so it truly unobstructive. The outsole is made of a thin sheet of Vibram rubber covered in narrowly spaced shallow lugs. The outsole feels like the outsole of a road shoe because there is so much surface area. The Vibram rubber seems to be very durable, it will not be the limiting factor for the longevity of this shoe. The Vapor Glove excelled as an all-terrain barefoot trail running shoe. The Vapor Glove is my absolute favorite barefoot road and treadmill running shoe and ranked highly on the trails. When barefoot running, you need to dance nimbly on trails and prudently watch out for any obstacles. As such, the minimal outsole proved to be enough for more rugged trails. Since the Vapor Glove is a barefoot shoe, it will only be comfortable for runners who have a smooth and efficient gait. The Trail Glove is the big brother of the Vapor Glove. It has a touch more padding, a touch more outsole rubber and a little bit more of a protective upper. The Trail Glove also has a wider fit than the Vapor glove. The Vapor Glove performs better than the Trail Glove on lighter trails and roads, but the Trail Glove works better on more rugged trails. These two shoes are functionally very similar. They are both barefoot shoes that are as minimal as they come. The Stealth is geared more towards roads, whereas the vapor glove is capable on all terrain. The Stealth has an uncomfortably wide fit. Overall, the Vapor Glove is more durable, more comfortable, has better traction and is considerably cheaper. The Stealth is a good barefoot running shoe, but the Vapor Glove works better than the Stealth in every situation. The Vapor Glove 3 is the best barefoot shoe that I have ever run in. The only tiny complaint that I had was that while running sockless on long runs, the upper would rub against my foot at the flexion point of the shoe. The Vapor Glove even looks pretty good, which is a feat for a barefoot shoe. It is hard to take off points for such a well-refined shoe, but I know that it will continue to improve in future iterations. Overall, If you are looking for a fantastic barefoot running shoe, this is the one for you. Are you a minimalist runner? There is a good chance these will fit the bill. a low-drop shoe that does fit like a glove – but it also has a good-sized toe box, so your toes will have space to play ‘n’ splay. I have wide and flat feet, and the Vapor Glove provided an excellent fit. It is a light and quick shoe that allows great feel of the pavement, while still providing effective protection from the road (but maybe try to avoid sharp rocks). I ran a half-marathon in the Vapor Glove and was pleased with their performance in the race. These are also extremely comfortable shoes for driving and walking. At 6.1 oz., the Vapor Glove 3 weighs only 0.5 oz. more than the lightest shoe on the market (Adidas Adizero Sub 2; a $180 shoe with 8 mm drop – quite a different shoe compared to the $80, 0 mm drop Vapor Glove 3). When wearing the Vapor Glove, it hardly feels like you are wearing more than socks – so although the shoe itself may not have cutting-edge technology to put a spring in your step, its low weight means your feet will be swinging less mass and you’ll be saving energy. Out of the box, these shoes provided extraordinary comfort and ground feel. They truly did feel like you were walking/running barefoot. The feel of the ground was also excellent, with sufficient protection from most objects commonly approached on the pavement (more on this later). These shoes have Vibram soles; as such, the grip is superb. The grip is like a gecko’s sticky fingertips. I always had excellent grip and did not slip, and these shoes even provided traction in wet surfaces. New to minimalist shoes? Allow time to adjust. Runners who are new to minimalist shoes will have some initial challenges with the Vapor Glove. When starting out, newbies are likely to experience tightness in the calves, and their feet may ache after runs. 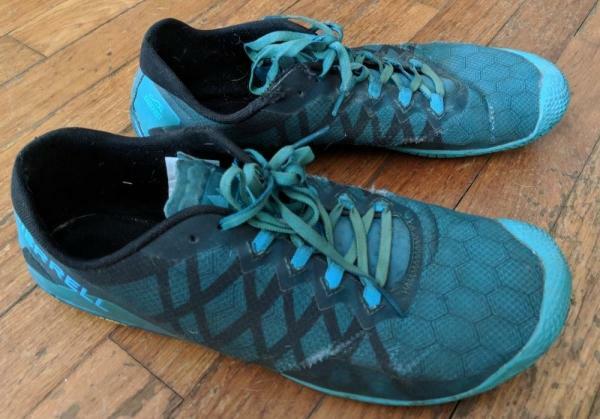 If interested in barefoot shoes, I would recommend walking in the shoes a lot, doing some short runs in the shoes, and/or doing some run/walks in the shoes. Another alternative is to ease into the barefoot shoe by first trying a low-drop shoe (e.g., 4 mm), and, if this works, then go to a barefoot shoe. I am a large runner (6’3”, 220 lbs), and I was still pleased with the Vapor Glove. Often, one hears that minimalist shoes are meant for lighter runners, or that larger runners require more support in their shoes. I would argue that it depends on the runner’s experience and the type of shoes that they have used. I have been running for 15 years (~3x per week) and eased into more minimalist shoes about 8 years ago, so running in minimalist shoes is not a problem for me. If a runner is large, has not run for many years, and has not eased into minimalist shoes, then these shoes would not be recommended. These shoes do provide not much support for the feet. Again, by design, the minimalist shoe will have minimal support, but it is important to note for those who have not run in minimalist shoes previously. As mentioned by other reviewers, the upper and the lower materials detached. In addition, the sole of the shoe failed over time – on my final run in the shoes today, a massive hole in the sole became unbearable. I bought the shoes in September 2017, and they failed at the end of July 2018 (~11 months of running 3-4 times per week). I do forgive the shoes though, as they are minimal shoes that are extremely and are therefore bound to be less durable. Another challenge with all minimalist shoes is the dreaded rock on the road. These shoes are so minimal that an encounter with a sharp rock can be quite painful, so it is good to avoid roads with a lot of rocks, and walking on gravel with these shoes. Again, this comes with the territory with minimalist shoes and should be expected. I’m not one to wear running shoes out for style…but honestly, this is especially true for Merrell. Although I like the color options, the look of the shoe is not great. It is perfect for a neighborhood walk, a run to the grocery store, or a long drive. It is not perfect for a first date, a night out downtown, or a day at work. But running shoes are not meant for those events anyway. Overall, these shoes were excellent minimalist zero-drop shoes that were comfortable, provided a glove-like fit while still allowing room for the toes, were feather-light and grippy, and allowed great feel of the pavement. The major limitation is the durability of the shoe. With the Vapor Glove 3, Merrell came close to perfecting the minimalist shoe. They fit great. They feel really really good. They're super comfortable. I picked this up about a month ago and I absolutely love them. Merrell presents an updated version of a favorite among minimalist runners: The Vapor Glove 3. Runners who are looking for a barefoot experience will find this shoe to do the job. For its third version, the Vapor Glove brings additional protection in the underfoot. The Vibram® outsole gets an update as well. Although barely noticeable, the shoe is a bit heavier than its predecessor. The upper unit still makes use of the mesh and TPU combination. The materials give the Vapor Glove 3 a sturdy construction without sacrificing comfort and breathability. The thin EVA midsole is now supported by a TrailProtect™ pad, which is a rock plate located in the midfoot area. It shields the underfoot from rough and sharp objects, such as debris and rocks. Meanwhile, the outsole upgrades its Vibram® compound from TC1 to TC5+. The Merrell Vapor Glove 3 has a standard running shoe length. However, runners with a narrow foot volume may want to go a half-size down because of the shoe’s widened and elongated forefoot area. The shoe is available in medium width for both the men’s and women’s versions. The Vibram® TC5+ rubber compound in the outsole is an update for the Vapor Glove 3; it is a sticky element that makes for solid traction to encourage long runs. It is a known fact that Vibram® outsoles are high-performers on tough terrain, and with this shoe, it is no exception. As a barefoot shoe, the outsole is a thin layer that conforms to the shape of the ground, but it does not scrimp on support and traction. This durable Vibram outsole is also used in another Merrell shoe, the Trail Glove 5. The outsole pattern is still the same as its predecessor, which presents slight flex grooves that promote a natural movement. Because the shoe is slim and almost weightless, it is foldable, portable, yet still durable. As a barefoot running shoe, the Vapor Glove 3 has minimal cushioning in the midsole. It uses compression-molded ethylene-vinyl acetate (CMEVA) that delivers comfort and flexibility even at such as small scale. Instead of a traditional insole, the shoe has TrailProtect™, an underfoot padding that shields the foot from sharp objects that could cause injuries. TrailProtect™ distributes pressure across the foot while maintaining suppleness. The upper of the Vapor Glove 3 is made of a thin, synthetic mesh that keeps the foot well-ventilated. Underneath it is a lining, also made of mesh, which absorbs sweat and moisture. As it promotes a barefoot running sensation, the forefoot area is roomy to encourage a natural toe splay. The ample space prevents overcrowding and blisters. On the outside, there is a textured guard to shelter the toes from outside elements. Thermoplastic urethane (TPU) overlays reinforce the mesh upper. It enhances the shoe’s structure to maintain its integrity, as well as provide support to the foot. To complete the protective features of the Vapor Glove 3, the tongue and collar are lightly padded. Although both are thin sections, they effectively hold the foot in place.